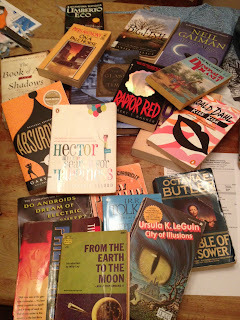 So this weekend was one of my favorite weekends of the year... the Wake County Library Sale. Although I didn't go as many times as last year (I went all 4 days it was open...) I still snagged a whole bunch of books and for only $20 yessss! 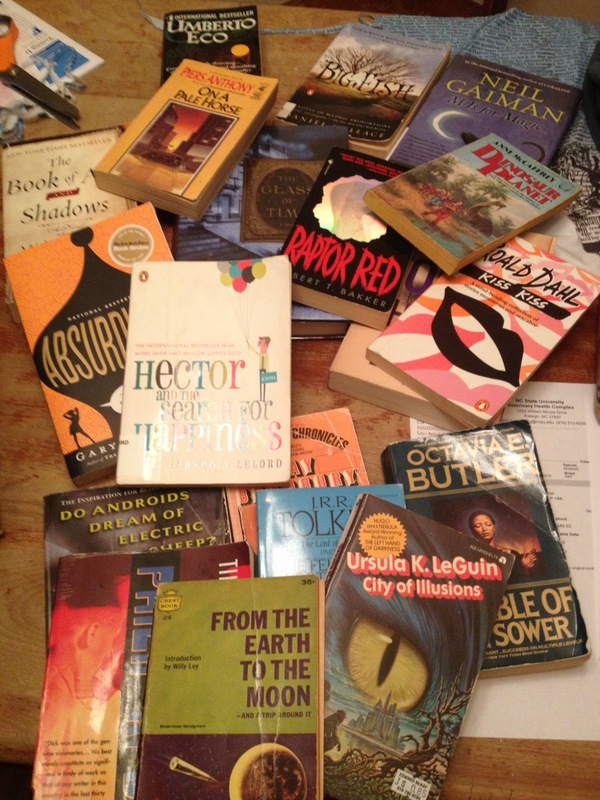 My actual haul was 19 books and that was after I told myself to put some back and forced myself to walk past all the pretty old books. 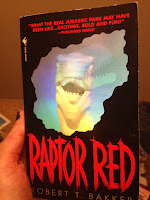 Also I need it to be noted that Raptor Red has quite possibly the COOLEST holographic cover in the world and the book itself is told from the perspective of a raptor... so I haven't even read it and it's found a special beautiful place in my heart. 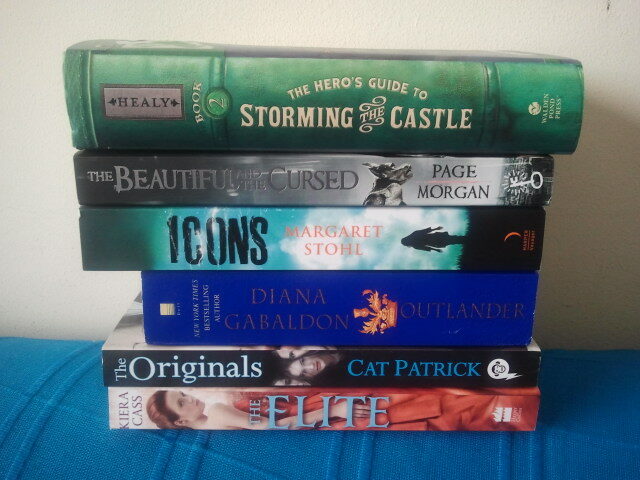 Now to get of the internets and roll around in glee on my new books! -The Program by Suzanne Young: seriously, this book just sounds like something that I will LOVE! -Raven Flight by Juliet Marillier: I squealed when I was approved for this, I loved Shadowfell! -Dragon's Child by M.K. Hume: I am slightly obsessed with King Arthur, so I think I will just devour this book. -Spies and Prejudice by Talia Vance: there are SPIES! And a lovestory lightly based on Pride and Prejudice! YES! -Shadowlark by Meagan Spooner: I'm a bit ashamed that I haven't read the first book in this series yet, but I will fix this! -Once We Were by Kat Zhang: I wasn't fully convinced by What's Left of Me, but maybe Once We Were will spice things up! -How To Love by Katie Cotugno: it sounds like a perfect summer read, dealing with real issues! -Once Upon a Tartan by Grace Burrowes: I've said it before, but there's really something about men in kilts..
-All Our Pretty Songs by Sarah McCarry: this sounds like it could be really amazing! -Unbreakable by Elizabeth Norris: I really enjoyed Unraveling and after that ending I NEED to know what happens to Ben and Janelle! -Fangirl by Rainbow Rowell: I've heard nothing but amazing things about the author's writing and am very excited to read this! -Dance of the Red Death by Bethany Griffin: LOVED MASQUE OF THE RED DEATH!! SO EXCITED! -Across a Star-Swept Sea by Diana Peterfreund: trusted sources tell me I need to read this series because I will love it, consider it done! -The Hero's Guide To Storming the Castle by Christopher Healy: The Hero's Guide To Saving Your Kingdom was SO FUNNY! I totally loved it and am excited to go on more adventures with Liam, Frederic, Duncan and Gustav! -The Beautiful and the Cursed by Page Morgan: it's set in PARIS and it sounds EPIC! -Icons by Margaret Stohl: ok, so I still need to read Beautiful Creatures, but I've heard REALLY good things about it and decided to just buy this one because it sounded awesome. -The Originals by Cat Patrick: it's about CLONES! Need I seriously say more? I received Tumble & Fall by Alexanda Coutts this week for review from FSG and I AM SO EXCITED. Definitely an anticipated read for Fall 2013. Basically the premise of this book is that there is an asteroid plummeting towards earth and there is nothing anybody can do about it and the book chronicles these last days of these teens who are just waiting for the world to end. I loved The Elite and The Program! Amazing books. :D And Rainbow Rowell is a brilliant author. 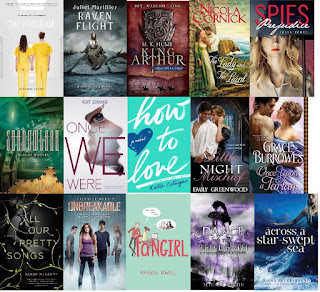 I want to read approximately all of these. I'm jealous! It's the second time today I've seen Tumble & Fall and I'm already stalking it like crazy - it sounds soooo good! Enjoy all your fab new books lovies! Daisy-- FDSTS isn't a series (yay!) but they are sort of companions in that they are set in the same world but I don't believe they share characters. Ah, thanks! :) I just assumed it was a series because it had #2 status on Goodreads ;) But I'm kinda glad it isn't a series, I read so many of those already! ICONS looks SO GOOD and The Program is one I can't wait to get my hands on!!!! This is one seriously awesome list!! WOW!!! Happy reading! 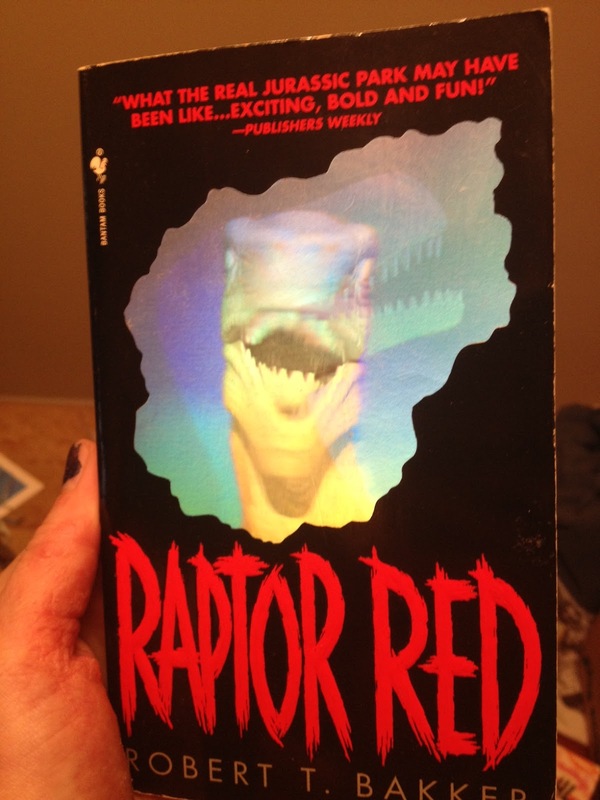 Dang that Raptor Red cover is brilliant! I need it in my hands right now! I love me some raptors so much! And the rest of your hauls are blowing my mind! You girls scored this week! thanks for reminding me about Hero's Guide To Saving Your Kingdom--I wanted to read it and lost it in the shuffle. I now have a library hold on it, so the goal is in sight! Also, I cannot believe there is an Anne McCaffery book I have not read. Must. Get. Involved. I don't care if the cover is cheese-tastic, I am sure I will love it! I never knew that Big Fish was a novel, I must go and find myself a copy this instant! Parable of the Sower is life-changingly good. Great haul. The cover for Tumble and Fall is beautiful. 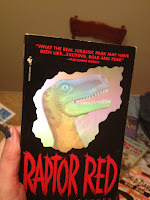 @ Paula Raptor Red was an excellent read. I read it three years ago and I loved it it totally blew me away. I hope you love it!